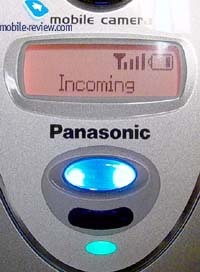 Panasonic successfully produced mobile phones for a Japan market for a long time. But it is less famous on the European market. The line of GSM phones is not large and it is not often renewed. The most promising elaborations are made for the home networks and only after that for the other markets. But recently the situation began to change. The company is paying more attention to the GSM products. 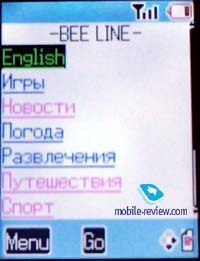 For the first time a folder type phone for the European market was unveiled on CEBIT and it created a sensation. 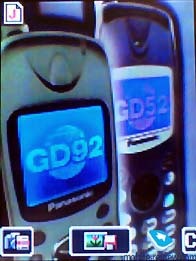 The success was predetermined, because Panasonic used the same principles and methods while creating GD87 as while elaborating phones for Japan. Panasonic GD87 is a typically Japanese model, in the finest sense of this word. The phone has a lot of innovations, which could be not notable at the first sight, but which make the life easier. However, let's begin from the very beginning. The handset is available in several colours (Silver and Cream). The dimensions and the weight are typical for the phones of this class (97 x 49 x 23 mm, 103 g.). The phone is handy but it is better to open it by two hands. 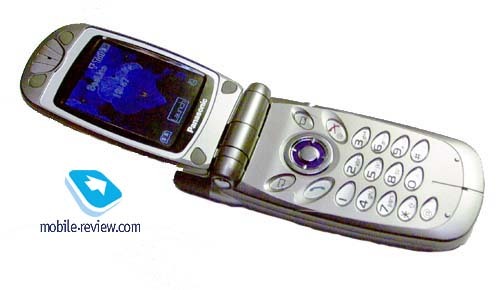 Hereby the phone resembles to Motorola v60, but it is lighter. If to look at the front of the phone, you can see a camera, positioned from above, and lower - a small mirror. The latter is necessary to take a picture from yourself. In other cases the internal display is used as a viewfinder. Lower there is an external display, which can show one text line and one service line with icons. Panasonic doesn't change its traditions, as always you can choose one of the 3 colours of the external display backlighting (orange, green and blue). 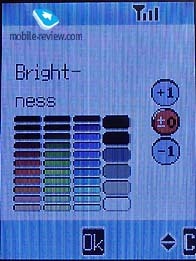 In addition, any of this colours could be associated to the different events (organizer, alarm-clock, incoming call, the specific phone number while incoming call). The backlighting of the external display can be switched off in the standby mode, pressing the key under the display. This key is also used as a service indicator, it has a blue light, which slightly pulsates while talking. The indicator becomes red while recharging the battery. Lower you can see IR-port and the second indicator, which has a green backlighting and doubled the main one, placed on the key. Unfortunately, you can't reject the incoming call by pressing the key on the front cover. The ringing tone just doesn't sound if you hold it for some time. A portable handsfree connector is placed on the right hand-side, upper there is a strap hole. One can see a loudspeaker on the rear cover. A system connector is positioned on the bottom side of the phone. A rubber cap for this connector is included in the standard kit. It fits securely there and can't fall by chance. Let's open the phone at last. The phone utters a click while opening and closing, what is nice. The handset almost doesn't have a horizontal backlash, the construction is very reliable and it would serve you for a long time. When you open the phone, you'll immediately see an internal display, which occupies the upper part of the phone. 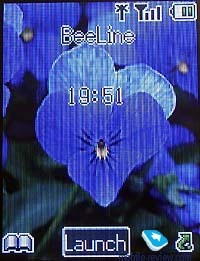 The display shows up to 65000 colours (TFT) and has a resolution of 132x176 pixels, which allows displaying up to 8 text lines, a line with tips to the soft-keys and a service icons. 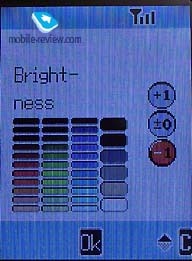 It is better to set a maximal contrast but you feel comfortable even if the average values are set. The information is clearly visible n sunny weather and in all other lighting conditions. In my opinion the screen is really magnificent, it is one of the best screens today. Some words about the keypad. It is made of plastic, the keys are well-spaced. Though they are almost all inside the phone, it is comfortable to touch them. There are two soft keys and one 4-directional navigation key with OK key inside it under the screen. The navigation is simple, the keypad is well thought-out, and you have no problems while working with it. The keypad backlighting is green. This model has lithium-ion battery of 720 mAh capacity. According to the manufacturers it can provide up to 220 hours of standby time and up to 7.5 hours of talk time. In practice the phone worked about 2 days (Beeline network) in case of 30 minutes talking and very active using (about 2 hours) of other applications (games, organizer, camera). If you use it less active, the phones will work 3 days. The time of full charging is approximately 2 hours. 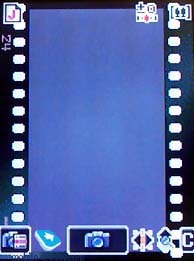 The menu structure is usual in Panasonic GD87. Press OK key and you are in the main many, which consist of 9 items. 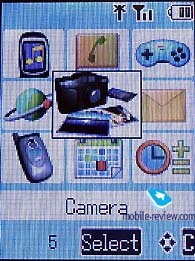 The selected item is indicated as an enlarged icon, a camera control is in the center. The engineers decided that an access to the camera should be the easiest and probably they are right. All the menu items have its own numbers, so, you can use shortcut numbers to access quickly the desired items. The moving through the menu is prompt, there are absolutely no breaks. The right soft key is associated to the shortcut, you can choose which item you'd like to set there. The left soft-key is always associated to the phonebook. Let's turn on to the main features. Phonebook. You can store up to 200 contacts in the phone memory. It is possible to add up to 3 phone numbers and up to 2 e-mail addresses to one name. 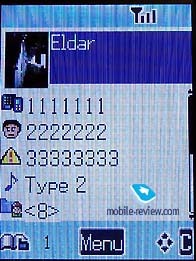 You can also choose a ringing tone and associate a name to a caller group (up to 8). 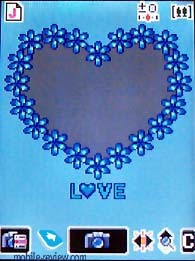 The main interesting feature is association of the name to an image or any graphical picture. The quality of the pictures is excellent; the phone is beyond comparison today. You see not all fields simultaneously while inputting the information. You can't see the field for the second phone number until you enter the first one. 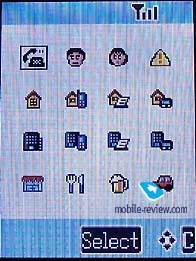 It's convenient that while entering the phone you can choose a special icon for it , the icons types (office, mobile and home) are not fixed. 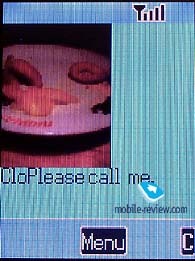 You can also write a small note and set a colour of the external display backlighting to the specific phone numbers. There is a search by the first letter in the phone. You can also view all the phone numbers in one list and sort them by the certain fields. Here is also a voice dial and a quick dial for up to 8 phone numbers. 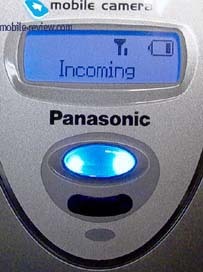 Pressing a send key in the standby mode allows you to view the call lists. There are three call lists here (received, dialed and missed phone numbers). 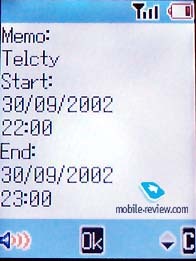 Each list contains up to 10 phone numbers with date and time indication. Messages. 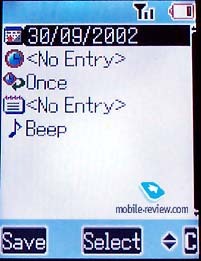 The phone supports three types of messages - SMS, MMS and e-mail. 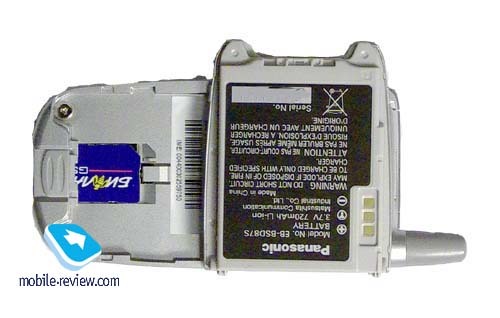 SMS messages can be kept only in SIM-card memory, the phone memory can't be used. The feature SMS Chat is available. 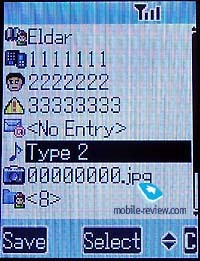 The handset supports a predictive text input - T9 (only for English yet). You can also create and receive MMS messages. It's easy to create a new MMS message. The quality and the size of the screen are ideal for that. The limit of one MMS message is 50Kb, you can keep up to 30 messages on the phone memory. 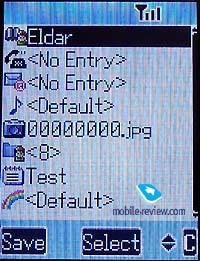 It is interesting that the phone has a special dynamical memory (780Kb) to store received MMS messages, files with ringing tones and pictures. You can also create up to 3 mail boxes, which can receive and send e-mails using POP3/IMAP protocols. 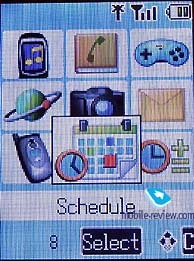 The feature is realized similar to other phone from Panasonic. The connection can be made via GPRS or without it. Browser. 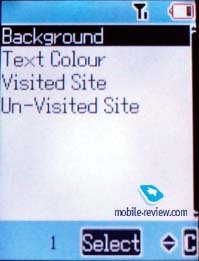 The phone has wap-browser (version 2), which allows to change the colour interface of the pages (not viewed). There are also many additional options such as changing the font size of the pages and other settings. Phone options. Everything is usual here. 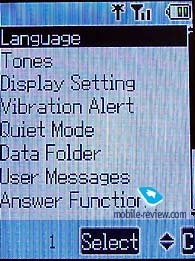 Different call timers, network settings, security settings are placed here. Schedule. You can see a calendar for 30 days here. 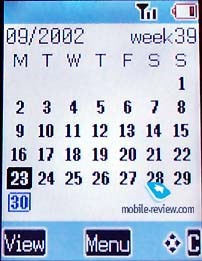 Days which have schedule events are marked in colour. It is possible to go to the desired date. The originality of the calendar is that you can yourself point weekends and holidays. 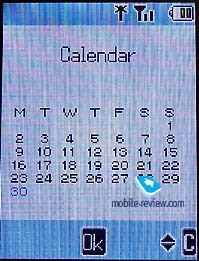 You can also set repeat periods and reminders for the events (once, daily, weekly, once a year). The advantage is that you can choose almost any file as an alarm-alert. Up to 100 events can be stored in the organizer memory. Applications. 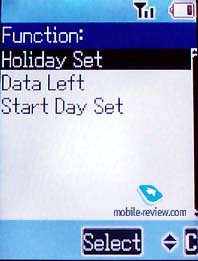 There is a calculator in GD87, due to the navigation key it is more functional than others from the other manufacturers. There is also a currency converter. Besides you can set up to 4 alarm-clocks with repeat options here, the repeat period is either one day or no repeat (once). 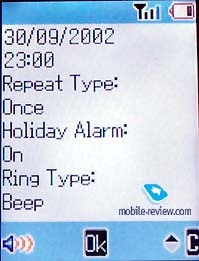 Any ringing tone can be choosing as alarm-clock alert. Time can be set for two tome zones here. It's possible to set the time of automatic power on/off. We can say also about a dictaphone. 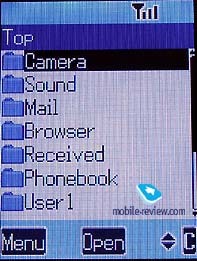 Up to 3 records (14 seconds each) can be kept in the phone memory. The dictaphone works in the talk mode too. IR port (for data receiving) can be activated in this menu. 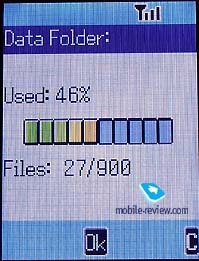 You can send almost any type of data from your PC, the phone saves them in a special folder. If the format is supported you can listen to the file or view it. We send midi-files and photos in JPEG format while testing. There were no problems with them. Unfortunately, data sending from the phone wasn't accessible in my sample, the PC always informed about an error. We hope that this shortcoming will be corrected later. Games. 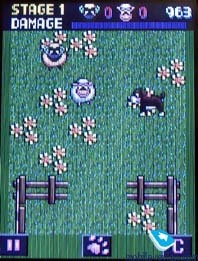 Two games - Tetris and Herding Sheep are placed in this handset. 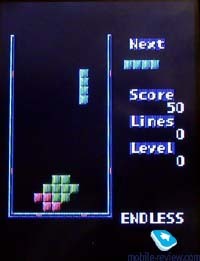 To say the truth you can waste much time while playing Tetris, it is really well done. There are several kinds of the game. The second game is also interesting to some extent. You control the dog, which should pen sheep. Sometimes sheep stand up to it and they can trample down the dog, the roles change. It's a pity that the game has only 5 levels, you can pass them all rather quickly. Personalize. 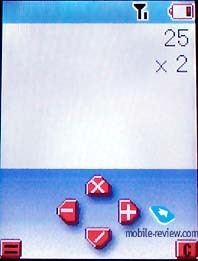 It is a tradition to Panasonic to collect all phone settings, connected with the user, here. 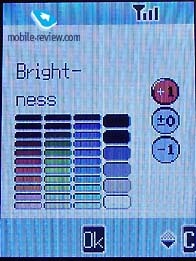 Firstly, you can select one of the 20 ringing tones. The phone has a 16-tones polyphony, which is rather nice. You can create your own ones in the misical editor or download any midi-file from PC. There are several kinds of vibrating alert here too - constant or interrupted. Key Guard feature is activated here too, it is just a key lock. Theoretically you don't need it because it is a folder type phone. To turn on it quickly you need to press and hold OK key for some time. 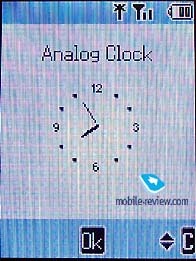 You can set a screensaver (like a calendar or clock (analogue or digital)). You can also set wallpapers, any graphical file can be a wallpaper but there are also 5 pre-defined types. 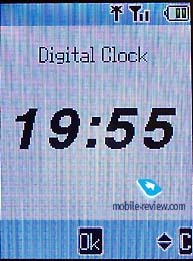 Such settings as the time of the internal display backlighting, the colours of the external display and adjusting of contrast are also hidden here. Camera. It is the most interesting feature in the phone. The quality of the pictures in the phone is much better than in all other products on the market today. It is really so, at least for the images on the screen (it was impossible to transmit information on the PC). The camera is activated by the double pressing the OK key in the standby mode, the display is used as a viewfinder. The images can be recorded in JPG format (Fine, Normal, Economy) or in PNG format (for the first time in GSM phone). You can't choose a picture resolution, it is always maximal and equal to the resolution of the screen (132x176 pixels). The average size of the usual shot is about 5 Kb. It is possible to store more than 100 images (dynamical memory - 780 Kb). 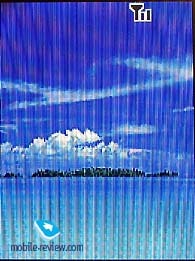 The camera is equipped by double Zoom, it is quite workable, and the quality of the picture doesn't loss. You can change matrix sensitivity while shooting (3 positions) and set a night mode. You can also set timer and use different effects (Sepia, Monocrome, Nega/Posi). 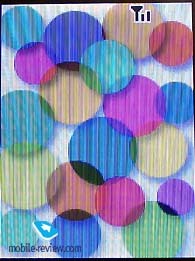 In the whole you have many possibilities to use your imagination, for example, to set different kinds of frames (up to 10). 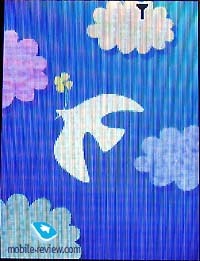 Received images are saved in the special folder, you can also send them with MMS message or attach to e-mail. To say the truth the camera capabilities are not bad. In spite of that the resolution of the images and screen are equal, it is a great step forward. A larger resolution of the other phone is rather a marketing action than a necessity. The quality of the images, taken by integrated camera is still much less then the quality of the pictures, taken by even very simple digital cameras. 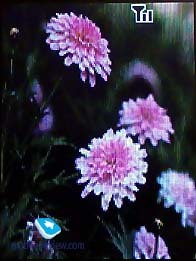 The quality of the phone is excellent; the volume of the loudspeaker is enough. A pleasing surprise is a separate work of two displays. While opening the phone, the external display is turning off to save the energy. The phone worked 3 days in case of average exploitation, it's not bad result for the phone with such screen. Apart form the portable handsfree, the phone can work in a handsfree mode and it differs it from the other handsets (LG, Samsung). The handsfree is similar to on is Panasonic GD95. As we've already mentioned, the phone has a 16-tones polyphone. 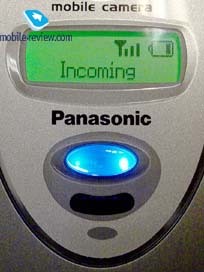 Ringing tones have an average volume, it's difficult to hear the phone from the bag. A vibrating alert is rather strong, you can feel it good. 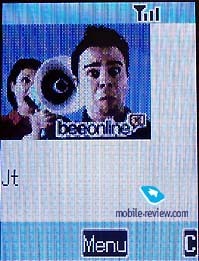 Here you can listen to the ringing tones (mp3, 1 Mb). The phone has GPRS but doesn't have bluetooth. It supports SyncML but doesn't have software for synchronization. Why? 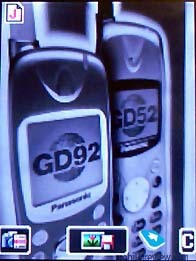 GD87 was created as an image phone and the aim was achieved by the engineers, it is one of the most interesting phones on the market. Panasonic GD87 would be launched at the end of the year. The price would be around 1000$ (Russian market only, price in Europe would be around 500$) and I am sure that it would find the consumers. 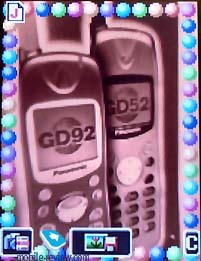 The market has a lack of the very expensive image phones and GD87 has all features, which are necessary for such phone. So, it is equipped by camera, has a polyphony, colour display and an external display, you have wide possibilities for personalization, using musical and graphical files. Surely, the phone must be successful. If to take into account that the price in the near 6 months wouldn't be less than 450-500 it would be rather popular in the high pricing group. The only rival model could be LG G8000, which would be launched also in the end of the year. Whether it will be successful or not, I don't know, but the consumers would surely choose Japanese quality while equal price. And I repeat once again that in my opinion Panasonic GD87 is one of the best image phones, appeared this year. May be it is not the most advanced, but it is very pleasing.